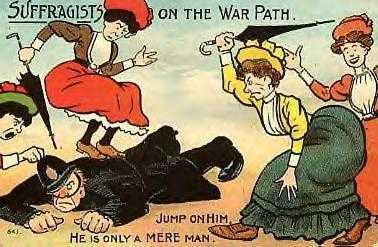 English: Postcard, printed, cardboard, polychrome, anti-suffrage comic card depicts a group of suffragettes using umbrellas to beat up a beleaguered policeman, printed inscription front: 'Suffragists on the warpath. Jump 'n him, He is only a mere man. '; printed inscription reverse: 'Millar & Lang Ltd'; manuscript inscription: 'With sincere hopes that you will not reach this stage from a mere man Miss W Green c/o Coachman Dawson Park Welling Kent', postmarked.